Fiesta, or as it is often colloquially called, Fiestaware, is a line of ceramic glazed dinnerware manufactured and marketed by the Homer Laughlin China Company of Newell, West Virginia  since its introduction in 1936, with a hiatus from 1973-1985. Fiesta is noted for its Art Deco styling featuring concentric circles — and its range of solid, vibrant colors. Both Fiesta's original shapes and its glazes were designed by Frederick Hurten Rhead, Homer Laughlin's art director. Several of the original shapes were redesigned (and other new shapes added) by Jonathan O. Parry, who became Homer Laughlin's art director in 1984. When the Fiesta line was re-introduced in 1986, it featured a more durable, vitreous composition. Fiesta is sold from "open" stock, where customers select by the piece, rather than by the set — and can mix and match pieces from the entire color range. According to the Smithsonian Institution Press, Fiesta's appeal lies in its bright colors, modern design, and affordability. In 2002, The New York Times called Fiesta "the most collected brand of china in the United States." Salt and pepper shakers showing the Art Deco design of Fiesta ware. Fiesta was introduced at the annual Pottery and Glass Exhibit in Pittsburgh, Pennsylvania in January 1936. It was not the first solid color dinnerware in the US; smaller companies, especially Bauer Pottery in California, had been producing dinnerware, vases, and garden pottery, in solid color glazes for the better part of a decade by the time Fiesta was introduced to the market. But, Fiesta was the first widely mass-promoted and marketed solid-color dinnerware in the United States. When it was introduced, the decoration of dinnerware and kitchenware ceramics was still inspired by the Victorian era, based on full, predetermined sets of dinnerware, all decorated with the same decal designs. With its solid color glazes and mix-and-match concept, Fiesta represented something radically new to the general public. The forms and surfaces expressed an Art Deco influence. At introduction, the Fiesta line of dinnerware comprised some 37 different pieces, including such occasional pieces as candle holders in two designs, a bud vase, and an ash tray. A set of seven nested mixing bowls ranged in size, from the smallest at five inches in diameter up to a nearly twelve-inch diameter. The company sold basic table service sets for four, six and eight persons, made up of the usual dinner plate, salad plate, soup bowl, and cup and saucer. But, the promotion and presentation of Fiesta from the start was as a line of open-stock items from which the individual purchaser could choose to combine serving and place pieces by personal preference and need. "COLOR! that's the trend today..." and it went on to say, "It gives the hostess the opportunity to create her own table effects....... Plates of one color, Cream Soups of another, contrasting Cups and Saucers....it's FUN to set a table with Fiesta!" The Homer Laughlin Company quickly added several additional items to the line. During this period some items were modified, and several items were eliminated, including the covered onion soup bowl, and the mixing bowl covers. In the years up to 1940, the line was expanded by the production of more new items. At its most numerous, the Fiesta line comprised approximately 64 different items, including flower vases in three sizes, divided plates, water tumblers, carafes, teapots in two sizes, five part relish trays, and large chop plates in fifteen-inch and thirteen-inch diameters. In addition, it offered several unique promotional items for one dollar each, available only in a predetermined glaze color. With World War II and the need for manufacturers to focus on production for that effort, non-war related production and public demand declined. Beginning in 1942, the Fiesta line of items began to be reduced. Over the next four years, the more unusual serving pieces were being discontinued, and by 1946, the line's variety of items had been reduced by nearly one third. Overall sales of the more typical place-setting pieces of Fiesta remained strong and reportedly peaked around 1948. The popularity of Fiesta was due to its bright colors, durable construction, stylized art deco shapes and designs, and its promotion through mass marketing. From its first introduction in 1936 and for over a decade, Fiesta products were a widespread fad. The dinnerware became something of a status symbol for late 1930s and pre-war 1940s middle-class households. Today, vintage Fiesta trades briskly on auction websites and at other antique/vintage product sales venues. The line name and design is still owned by the Homer Laughlin China Company of Newell, West Virginia, which was the original company that produced and marketed it. Except for minor adjustments due to manufacturing requirements, the design of the original shapes remained virtually unchanged from 1936 to 1969. As home decorating color styles changed, the company changed the solid color glazes. The texture of the original glazes, and throughout the life of vintage Fiesta, was semi-opaque. This is smooth and glossy, but without any shining glare, rather more like an eggshell. The ware sometimes shows " glaze curtains", areas of uneven glazing where a heavy application meets a lighter one. At its introduction in 1936, Fiesta was produced in five colors: Red (orange red), Blue (cobalt), Green (light green), Yellow (deep golden), and Old Ivory (yellowish cream). By 1938, two years into production, a sixth color was added: Turquoise (robin's egg blue). With the exception of the Red, this color assortment remained in production until approximately 1950. The original Red had been discontinued before 1944 (see below). The lack of this vibrant color, plus the general changes in society due to the United States' participation in World War II, had caused a slump in sales of the larger serving pieces from the early 1940s. Prior to this reduction in the number of shapes offered, only one or two very specialized shapes had been discontinued and those by 1938. Later items which were discontinued, such as covered onion soup bowls in turquoise glaze and mixing bowl covers in any color, are scarce and highly prized by collectors. By 1950, home decorating styles and colors had changed. The Homer Laughlin Company discontinued some original glaze colors and replaced them with four new colors. The original Blue (cobalt), the original Green (light green), and the original Old Ivory (yellowish cream) were discontinued, replaced by Rose (dark pink), Gray (medium), Forest(dark green), and Chartreuse (bright yellowish green). Two existing glaze colors, Yellow and Turquoise, allowing the company to offer six colors through the 1950s. By the end of the 1950s, sales had again dropped. The company reduced its offering of items and changed the glaze colors. By 1959 the United States government had released its block on uranium, which enabled the Homer Laughlin Company to produce the original bright orange-red glaze again (see below). The company discontinued the four glazes of the previous decade in favor of four new choices. A wholly new glaze color of green was developed and marketed at this time. Although the company always referred to the new color simply as Green in its brochures, collectors later called it Medium Green, to distinguish it from other green glazes which the company had produced. The Medium Green is a bright, almost Kelly green. Some have described it as a "John Deere Tractor" green. Beginning in 1959, Fiesta was available in the following colors: Red (original orange red), Green (new Medium green), Yellow (original golden), and Turquoise (original robin's egg blue). Although this color assortment was available and sold for ten years (1959–1969), the popularity of Fiesta had fallen. The newest shade of green is in very short supply on the secondary market relative to the other glaze colors. It has gained almost mythical status and, for certain pieces in this glaze, commands astronomical prices wholly disproportionate to the rest of the line. The Yellow glaze is the one glaze that was in production throughout the life of vintage Fiesta. Turquoise, while not strictly an original color (having been introduced about a year into Fiesta's production) was otherwise also in continuous production until the end of the original vintage era in 1969. Red, while an original color at the line's introduction, was removed from the market before 1944 (see below). Although it was brought back into production from 1959 to 1969, this was after most of the unusual serving pieces had long been discontinued. Red pieces also usually command a premium price in the secondary market, both for its vibrancy in the mix of colors and for its scarcity due to limited years of production. While many collectors love all the colors, some only want those of the "Original 6" or "Fifties Colors". Geiger counter (kit without housing) audibly reacting to an orange Fiestaware shard. Brilliant red Fiesta (and indeed the red glazes produced by all U.S. potteries of the era) is known for having a detectable amount of uranium oxide in its glaze, which produced the orange-red color. During World War II, the government took control of uranium for development of the atom bomb, and confiscated the company's stocks. Homer Laughlin discontinued Fiesta red in 1944. The company reintroduced Fiesta red in 1959 using depleted uranium (rather than the original natural uranium), after the Atomic Energy Commission relaxed its restrictions on uranium oxide. Red is not the only color of vintage ceramic glaze that is radioactive; it is detectable from other colors, including ivory. The level of radioactivity of vintage fiestaware has been published and is available online. The U.S. Environmental Protection Agency warns consumers not to use radioactive glazed ceramics for food or drink use. Others recommend against using such pieces for food storage due to the possibility of leaching of uranium or other heavy metals (often present in some colored glazes) into food, especially acidic foods. Included in the report was a product that has not been sold in the market for nearly 40 years, Antique/Vintage Fiesta dinnerware. The anchor narrating the segment passes a radiation measuring tool over several products including the Antique/Vintage Fiesta plate that was produced nearly 70 years ago. The narrator also stated that it was taken off the market because when people heard about the uranium in the glaze, they did not want to buy the product. In fact, The Homer Laughlin China Company stopped manufacturing all Fiestaware in 1972 because of low sales. The product that was used within the segment has been discontinued and has not available for close to 40 years time. Fiesta today is frequently tested by federally licensed independent laboratories and is lead free, microwave/dishwasher safe, oven proof and made in the USA. . . . Prior to World War II, it was common practice for manufacturers of ceramic dinnerware to use uranium oxide in color glazes. The Homer Laughlin China Company was no exception, using this material in the original “Fiesta Red” glaze, among others. In 1943, the U.S. Government stopped all civilian use of uranium oxide because available supplies were needed for the war effort. Homer Laughlin stopped producing the red glaze color at that time and for that reason. Nonetheless, this interruption in production is believed to be the source of the rumor that Fiesta’s red glaze was removed from the market because it was radioactive. In truth, the red glaze emitted far less radiation than some other consumer products. Following the lifting of wartime restrictions, Homer Laughlin again began producing the red glaze in the 1950s, using a depleted grade of uranium oxide. Homer Laughlin stopped all use of depleted uranium oxide in 1972 and it is not used in Fiesta Dinnerware which is produced today. By 1969 home decorating tastes had again changed. The company restyled the shapes of Fiesta to try to modernize it. Finials on covers, handles on cups, bowl contours and shapes, were all modified to give Fiesta a more contemporary appearance. The glaze colors were also changed, with the choices being limited to three colors for the place-setting pieces, and one color for the five major serving pieces. These were the remainder of the 64-piece assortment of shapes. Although essentially the same Red glaze as had then been available since 1959, it was renamed Mango Red. Replacing Yellow, Turquoise, and Medium Green, were two new glaze colors. One was Turf Green, which nearly matched the popular Avocado color of the day. The second color was Antique Gold, a brownish-yellow which nearly matched the popular Harvest Gold of the era. The line's name was changed to "Fiesta Ironstone". The shape redesigns and color changes did not restore Fiesta's popularity, and in January 1973 the company discontinued the Fiesta line. As is common with many dinnerware shapes, the manufacturers add different decals to the shapes and give them new names. Throughout its long life (1936–1973), the item shapes of Fiesta were often decorated with decals and marketed under other names, or a name variation. One example was "Fiesta Casuals", which consisted of two patterns, one with yellow and brown florals and accented with solid color Fiesta yellow items, the other with turquoise and brown florals and accented with solid color Fiesta turquoise items. As another example, in the late 1960s, the shapes of Fiesta were glazed in a dark 'bean-pot' brown, flat pieces were given an underglaze 'Mediterranean-style' geometric decal in black, and the line was marketed as "Amberstone" in a supermarket promotion. Later these shapes were glazed in Antique Gold, with a different stylized pattern under the glaze. This line was dubbed "Casualstone" for another supermarket promotion. Fiesta ware being sold at a charity fundraiser. During the 1970s, a new appreciation for Art Deco designs from the 1920s and 1930s flourished. Along with this, the baby boomers were establishing their own households. They made Fiesta popular once again. Almost immediately after Fiesta was discontinued in January 1973, collectors began buying heavily in second-hand shops and the newly popular garage sales. Due to the enormous popularity of Fiesta in the secondary market, its prices skyrocketed. By the end of the 1970s and into the 1980s, Fiesta items once costing pennies were commanding nearly a hundred U.S. dollars for scarcer items. By the mid-1980s, prices had climbed higher. Certain pieces and colors were being traded for hundreds of dollars. The Homer Laughlin China Company noticed the activity on the secondary market. After a production lapse of 13 years, in 1986 the company marked the 50th anniversary of Fiesta by its reintroduction. Prior to mass production and promotion, Laughlin used the original semi-vitreous clay body on shapes taken mostly from the last incarnation of vintage Fiesta (1969–1973). The company then changed the body to a fully vitrified clay, to enable marketing to the restaurant and service industry, as this clay was more durable. Many original shapes required a redesign because of shrinkage associated with the new clay. Although old and new runs appear similar, direct comparison demonstrates the newer pieces (made with the fully vitrified clay body) are noticeably smaller. In addition to redesigns, new shapes were added to the line. Apricot (pale pinkish tan) (1986-1998). The glaze texture on this new Fiesta is very smooth, hard and much shinier than the original Fiesta. Since its introduction, new Fiesta has remained popular. In addition, it has increased collector interest in all the lines. Many people are collecting vintage pieces, as well as purchasing new items from department stores and catalog retailers. Fiesta collectors often add this new ware to existing collections of vintage Fiesta, while others concentrate on buying from the new assortment. Early in Fiesta's second incarnation, the Homer Laughlin Company marketed it as a new collectible. 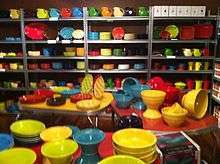 The manufacturer has maintained interest in Fiesta and manipulated the collectors' market over the past 20 years by discontinuing glaze colors, and by limiting production quantities on some items, or controlling production time frames. Similar techniques have been used by numerous other housewares, china, silver, toy, ornament, etc. companies. Since the reintroduction of Fiesta in 1986, Homer Laughlin has introduced three colors that were available for two years: Lilac (1993–1995), Chartreuse (1997–1999) and Juniper (1999–2001). Sapphire was sold exclusively at Bloomingdale's from 1996-1997. In November 2008, Homer Laughlin released the limited-edition color, Chocolate. The color of milk chocolate, the new shade adds a second neutral tone to Fiesta's color palette. It was available for a limited period of time and in a limited number of pieces. In 1997, 500 limited-edition presentation bowls in an exclusive Raspberry (reddish maroon) colored glaze were made to commemorate the production of the 500 millionth piece of dinnerware carrying the name Fiesta produced by the Homer Laughlin China Company since 1936. In anticipation of Fiesta's 75th anniversary in 2011, Homer Laughlin announced its 75th anniversary color: Marigold. In addition, it introduced the first of a line of specially backstamped annual anniversary items, a set of three baking bowls, at the 2008 International Home and Housewares Show in Chicago, Illinois. This was followed by the introduction of a large serving platter in 2009 and a numbered soup tureen. Dinnerware and accessories were available in 2011-2012, with each introduction marketed for 75 weeks, beginning April 1, before being retired. As an indication of its influence, Fiestaware was featured in a design exhibit at the Cooper-Hewitt Museum in New York City in 1988. In 2009, a new line of square Fiesta dinnerware was introduced. Square is available as Dinner, Luncheon and Salad Plates, 19 oz. Bowl and Mug, 4-pc place settings as well as a full FIESTA line of accessories. Despite square silhouettes, pieces maintain a strong relationship to the company’s established ‘round’ deco offering; coupe shape and height remain the same, along with the brand’s signature concentric rings. American Fiesta, a one-man play written and performed by Steven Tomlinsoni, refers to the central character's obsession with collecting vintage Fiesta dinnerware. In Armistead Maupin's Tales of the City stories, there are several references to Michael Tolliver collecting Fiestaware items. 1 2 3 "Legacies: Collecting America's History, Fiestaware, about 1940". Smithsonian Institution Press. ↑ "A Different Shade of Green". The New York Times, Kelly Alexander, November 30, 2002. 1 2 "History of Homer Laughlin Pottery". The Collector's Encyclopedia of Homer Laughlin China, Joanne Jasper at Missingpiece.com. ↑ Kelly Alexander (December 1, 2002). "The Way We Live Now". The New York Times. 1 2 Huxford, Bob; Sharon Huxford (2005). Collector's Encyclopedia of Fiesta: Tenth Edition. Paducah, Kentucky: Collector's Books. 1 2 Oak Ridge Associated Universities (January 20, 2009). "Fiesta Ware (ca. 1930s)". Retrieved April 16, 2011. ↑ Vaughn Aubuchon (2006). 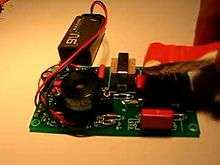 "Geiger Counter Performance Data Compared - My Measurements". Retrieved March 20, 2012. ↑ United States EPA. "Radioactive Materials in Antiques". Retrieved April 16, 2011. ↑ "Statement regarding the Good Morning America broadcast," The Homer Laughlin China Co., 16 March 2011, accessed 25 March 2012. ↑ Curtis, Wayne. "China Town" American Heritage, April/May 2004. ↑ "A Nation Bound by Colorful Dinnerware". The New York Times, Ginia Bellafante, April 28, 2007. April 28, 2007. Retrieved May 2, 2010. Rowe, Willyum. Fiestaware: a booklet. Rochester, NY: Press of the Visual Studies Workshop.